Day 9 of my Japan trip was spent visiting various shopping districts to get prices and hopefully buy something cheaper than what I can get in Australia. It is truly a myth that prices in Japan are higher than those in Australia and the US. Sure prices for some types of goods in Japan are more expensive than what you'd expect but generally they are quite acceptable even taking the exchange rate into account. Transport or getting around is inexpensive if you take the trains. The train stations are the hubs for major shopping and entertainment districts so its usually a easy walk to what ever you may want to visit. Rather than writing about the things which are the same prices I shall focus on the stuff which is cheaper in Japan. High end or top of the range digital cameras and camcorders are cheaper in Japan. The models are usually the ones which aren't available anywhere else in the world until some months or weeks later. These models are cheaper in Japan than anywhere else in the world. However there is a caveat. The models are Japan only so menus and warranty only apply in Japan. The model name may be different, eg. IXY = IXUS. Most have language settings so ask the sales person to change it to English settings or play with a demo and work out how to change it your self. The battery charger may also be different but all the cameras I've bought over the years have international adapter or transformer. Go to Akihabara for the widest range. BIC Camera has lots of small multi storey stores but the big one is in Akihabara. Not the cheapest but has the most complete range. They also accept foreign credit cards! But most of all they also have a catchy theme tune. As for other electronic or computers, most are Japan only versions. SD memory cards or Sony memory sticks cost much more compared to Australia or the US. Apple products being price fixed are about the same price as in Australia with the exception of iPods. They are about $50 cheaper when I was there. Of course they are cheaper in the US. I must warn you about shopping for clothes or luggage in Japan. It is expensive for things such as backpacks, satchels, and all clothing whether brand name or not. There are plenty of stores for all sorts of clothing and usually decent looking sort of stuff. I guess you could call it fashion focused as opposed to practical? Again grand names or not it is expensive. For example the decent Rip Curl satchel I used cost only $30 in Big W but a similar thing costs 20000 Yen. 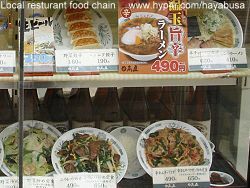 Try around Ueno station where there are lots of smaller stalls or any of the big department stores like Seibu and Tobu. Souvenirs such as Saki sets and Geisha dolls, famous prints are priced between 1400-2100 Yen, I recommend Asakusa area for the best range. There are lots of temples to check out too! Brand name watches are cheaper in Japan than in either the US or Australia. Even the big department stores carry Swiss brands such as Rolex and Omega. You can also be certain that they are the genuine items since the Japanese don't like fakes. However beware that the models vary from store to store and of course - as any watch connoisseur would know the some models look almost identical but pack much different mechanisms. This difference can cost lots of dollars. The difference in prices can range from hundreds to thousands of dollars saving for the same watch in either country. You can also get very trendy hand made watches you won't be able to get anywhere else. Go to Shinjuku for the best range. Again the premium brands offer the best price differential. Food and dining is always an issue because most of us tourists are simply too scared or set in our ways to try something else. I say forget your usual diet and try something new. There is more to Japan than Sushi and Sashimi. You won't get sick eating food in Japan. Let's face it they are super clean compared to New York or Sydney and London. The local food is much cheaper than foreign menus. Meat and even fish costs a fortune in restaurants. Eating at western style restaurants can easily cost A$100 for two. Eating at a Japanese style restaurant costs $15-20 for two. At these locals you often get a Kirin beer as part of the dinner as well! However go into Tokyo city and find the best gourmet restaurants in the world - you will need to book. For automotive products you'll have to go out of Tokyo city for the best range. This applies to car or motorcycle accessories. There's only a little area in Ueno that has some accessories for motorcycles but it's mainly clothing and decals. Nothing else is suitable for overseas use. See my visit to Yokohama page for one of the best places for shopping for this sort automotive stuff. That's it on shopping for now - I'll have he final leg of this trip next week. Then its time to edit all the pages because I'm sure there are a ton of grammatical and spelling errors!